Here is a list of all the postings Keith Lomax has made in our forums. Click on a thread name to jump to the thread. Scotland topping the table - a rare sight so enjoy it for a week! I'm currently plagued with automated calls says BT will cut off my Internet today. The voice was initially of the computer generate sort, but the last was an elderly British accented man. Where applicable, isn't BT the base cause of this, allowing ridiculous phone call rates? What sort of legit. business needs this? This one is not about call rates. What they want you to do is to access their website and hand control over to their "tech support" department under the premise of checking out the problem, but will install a virus or trojan that watches your keystrokes and captures your passwords. Some of the more sophisticated ones also trap the cookies that store remembered passwords. Several years ago, somebody who I know initially fell for this, and once she saw that he was trying to install something she tried to shut the PC down but every time the mouse got close to the menu button the remote user moved it away. She had the foresight to disconnect her broadband connection (pre- wi-fi) before any damage was done. My answer to these is to ask which computer is causing the problem, and when they say "the Windows one", I say that we only have Apple products, or vice-versa. (Similar to the above poster changing his ISP). I previously worked for a vehicle leasing company with a private customer base. We had a spate of calls from customers saying that we had disclosed personal details. On investigation, we narrowed it down to customers who had made insurance claims, so the insurance company's fraud department took over the investigation. They found that the common factor was the national chain of bodyshops that they used for most repairs - at this stage it was found that people (probably the delivery/collection drivers) in individual branches were noting details of customers' names, addresses and phone numbers and selling them on leading to calls along the line of "we are calling about your recent accident". With the going rate for this level of detail and a definite accident, apparently they were quite lucrative, especially to somebody on minimum wage. However, calls such a Geoff's wife's are usually just randomly called numbers and they don't usually actually have the name and address. My wife got one yesterday saying that they "were in the area doing soffits and facias for one of our neighbours", but then asked for our postcode! As an aside, about 25 years ago I was at a friend's home, with a few others when he took a phone call. He played along to what was an obvious salesman, and got to the point of making an appointment for one evening the following week, and gave his address. He then said, when the salesman arrives, he should take the lift to the tenth floor. When the caller queried this, he replied along the lines of "if you are going to waste my time trying to sell me a conservatory, you should check your facts before you call". Thread: In your late 60s or early 70s? Completed. I wonder how many households benefit from the free license ie how much more revenue would be raised by doing away with free licenses? One of the oddities if that if anyone in the household is old enough for a free license, or the discount for being partially sighted, then the rest of the household get the benefit. So a couple in their 50's both working have to pay it but if one of their parents then moves in they get it free. Well it works for driving licences - people still drive without licences but if they get caught the police can prosecute. So the culprits are punished and licence holders can still drive. Thats what we want isn't it - safe flyers to be able to continue? If a drone flyer endangers an aircraft he can be prosecuted for for endangering an aircraft and get five years inside. Having (or not having) a licence/permit/registration has nothing to do with that or help bring criminals to justice. The argument that drone registration will make it easier to trace offenders is a nonsense - offenders will not register. I heard a knowledgeable lady talking on BBC Newsnight last night about drones carrying 'beacons' for identification (Transponders?). The point is that those will criminal intent will not carry them, only the law abiding who don't need them will. You can legislate until you are blue in the face but it is all for nothing without enforcement. At Gatwick the authorities have been unable to enforce, despite the drones being clearly visible. I find this very sad for the tens of thousands of people affected and bizarre that contingency measures weren't in place to bring this incident to a close in minutes rather than days. Nor will an extended driving ban and a(nother) suspended sentence stop the unlicensed driver from driving. Those saying that all drones should be fitted with technology to prevent and/or detect action such as we have seen over the last few days, could equally say that driving licenses should be chip and pin, and all cars fitted with a card reader so you can't drive without being in possession of your license. It wouldn't stop people disabling the technology and there would be a lucrative black market in stolen licenses. Thread: Can a drone fly at 10000ft? It's possible to fly a drone at any range now using the 4G network and a smartphone or laptop. No need for a transmitter. Whilst the range of 4G can be tuned to 5 miles or more, this is to cover areas such as in the US where population is sparse and roads are straight. To reach this range, the cell sites would have to be focussed into a fairly narrow conical beam. In the UK, cell sites are more closely spaced and the range is configured (usually) into a 120 degree arc (ie. 3 actual cells on each mast) with a range of 2-3 miles horizontally and a few hundred feet vertically. The mobile companies would not waste money creating cell sites to give coverage 2 miles up! Thread: BMFA mag's going a bit over the top? Why didn't we get a new copy of the rulebook that is clear yet concise and focussed on the important matters only. A full reprint costs around £30,000, so we try to do this around every four years. Using HTML you can create your website on your computer and load it up to your server as and when you need to. Any alterations are recorded on your home site, then load them up to your server. Keep a copy of your site on a memory stick, update the copy on the stick as you update the site and bobs your uncle. Never lose your site in the future. Better still, make two memory stick copies, and give the second one to another committee member to store. This protects the club against both you leaving (for any reason) or something unfortunate such as a fire at your house. Buy a third memory stick so when you update you put the copy on there and swap it with the other committee member. I've been back in the hobby for five years or so and a BMFA member for all of that time, and I've never seen a sticker!! Are some people getting more than their fair whack of the stickerage? Can I get a refund, do you think?? Did you join the BMFA as a Country Member (ie. directly) or through a club? For country members the sticker should have been sent with your membership card. For club members, they are sent to the clubs to distribute along with the cards. Or, you can keep an image of it on your phone (if you have a suitable device) then you always have it with you. The number of times that people turn up to other clubs and fly-ins etc. without the card should be reduced. Fellows get 5 votes I believe, not something I agree with, I think it's to equate to the numbers of a small club, recognise people who've contributed a lot is fair enough, but one man/woman one vote for me. Members up and down the country have put a lot into the hobby, many serve on committees, do work at clubs, these people don't get 5 votes a club level, it's a bit daft to me. Fellows do indeed get 5 votes, but only in the specific case of a card vote at a general meeting (either Annual or Extraordinary GM). I have attended all such meetings since about 1989 (30 AGMs and 2 EGMs) and I can only remember a handful of card votes in that time; usually in relation to the subs. Most decisions are taken by a show of hands at the meetings and card votes are only called if the show of hands is close; we don't have five hands. For the annual elections to Elected Officer and Technical Committee posts done by postal ballot (if there are enough nominations) we get the same one vote as all members. There are currently around 40 Fellows, most of whom do not attend the AGMs, so the total combined voting strength (if all voted the same way) is less than a large club. So, in conclusion, whilst the 5 votes per Fellow is historic and probably wouldn't be created if the Society was set up today, it has minimal (if any) impact in reality..
BMFA News is almost self funding from Advertising revenue. Where are you getting that from? All that I can see in the budget is a line for "BMFA News Costs". It would be nice if it was self funding, but the £158k is the net cost after less than £20k of advertising revenue. There is a new advertising agent and early indications are that the advertising revenue will increase (but not eightfold!). For those looking at the increase as a percentage, I'm afraid it is not that simple. The budget is set on the basis of starting with what we plan to spend, and then dividing by the expected number of members. - a deficit in 2017/18 and a likely one in 2018/19, covered from reserves but these should be replenished. Year ago, I bought some fittings for plasterboard that are a metal conical threaded spiral about 20mm long and max 10mm diameter for the screw and slightly larger for the front face. The front face has a cross suitable for a mid sized Phillips screwdriver, so you screw it into the wall and it cuts its own hole. the centre of the cross is then a threaded hole down the middle of the cone. They were supplied with a matchings screw. Because the fitting takes the weight into the plasterboard, and the screw is always screwed into the metal fixing, it doesn't need to be either long or thick. The limitation, obviously, is how deep you get before you hit metal - but it might be possible to hacksaw a mill or two off the end without affecting operation. Shortly after I started aeromodelling, I was chatting to a guy at a model show (probably Wings and Wheels) who was a Polish ex-RAF WW2 pilot. 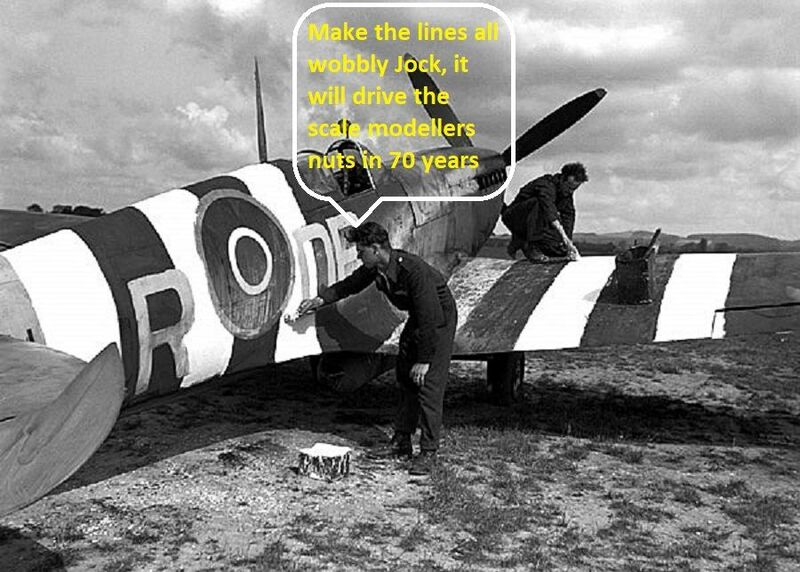 He said that the evening before D-day all pilots and ground crew were sent out with buckets of white paint and yard brushes and told to put the stripes on as quickly as possible. He said that any scale models with straight white lines were a dream and not reality. What has this got to do with RCM&E ? This section of the forum is …. Anything off-topic including the famous Cafe - shoot the breeze! It's synchronised to the rest of the EU, so that all of Europe changes clocks at the same time. the US changes their clocks at different times. For this week only, we are only 4 hours ahead of New York and not the usual 5. It hasn't always been synchronised. When I started work in the mid 80's, Europe changed at the end of September, and then until the UK changed at the end of October the clocks were the same. When the EU decided to harmonise the change dates, the rest of Europe fell in line with UK! It actually caused me to miss a plane! I was working for Ford, who had their own internal airline for hopping between European locations. Department secretaries / administrators made the bookings and typed the ticket on a multi-part carbon form. I had requested the flights by flight number for a day trip to Cologne. The secretary booked the flights but typed the flight times onto the requisition from memory, not realising that to accommodate the same time, the German departure times were an hour earlier. I arrived at the Cologne plant gate for the shuttle bus to be told by Security that it had left an hour earlier, then got a taxi to the airport to find that it had left and my requisition had the wrong time. Thread: they are still at it.(PayPal). Along the same lines, I get an average of about one phone call a week telling me that they have detected suspicious activity on my broadband. I do know somebody who got caught by this about five years ago, she was caught on a bad day and signed on to their website, she quickly realised that it was the wrong thing to do but everytime she moved the mouse towards shutdown it was moved away.. She had the foresight to disconnect her PC from the internet connection before any damage was done. She then ran virus checker before she reconnected and found about ten! I always use ipostparcels.com, which is the parcel division/brand of UK Mail. I have had no problems, but with any insurance the real proof is how they handle claims, which fortunately I haven't had to do yet. I have, however, had to claim for Royal Mail for an item not delivered; and without even proof of posting or a purchase receipt for the item, they refunded the amount that I claimed (although it is capped at 100 times the price of a first class stamp).